Chrysocolla is a hydrated copper phyllosilicate mineral with formula: Cu2-xAlx(H2-xSi2O5)(OH)4·nH2O (x<1) or (Cu,Al)2H2Si2O5(OH)4·nH2O. 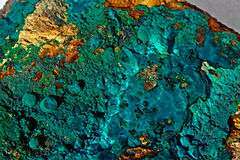 The structure of the mineral has been questioned, as spectrographic studies suggest material identified as chrysocolla may be a mixture of the copper hydroxide spertiniite and chalcedony. Chrysocolla has a cyan (blue-green) color and is a minor ore of copper, having a hardness of 2.5 to 3.5. The name comes from the Ancient Greek: χρυσός κολλα (chrysos kolla), "gold glue", in allusion to the name of the material used to solder gold, and was first used by Theophrastus in 315 BCE. It is typically found as botryoidal or rounded masses and crusts, or vein fillings. Because of its light color, it is sometimes confused with turquoise. A 2006 study has produced evidence that chrysocolla may be a microscopic mixture of the copper hydroxide mineral spertiniite, amorphous silica and water. Wikimedia Commons has media related to Chrysocolla. ↑ Spencer, Leonard James (1911). "Chrysocolla". In Chisholm, Hugh. Encyclopædia Britannica. 6 (11th ed.). Cambridge University Press. p. 320.